This work attempts to begin the process of interpreting the major phases of Buddhist Cosmological speculation by seeing in them various dramas of salvation tailored to the philosophical and theological predilections of their respective traditions. To a large extent, this interpretation relies on an examination of continuities between the Buddhist cosmologies and those of the Hellensitic world as a whole. In the course of this study, two major cosmological traditions emerge; those which rely on metaphors of time and those which rely on metaphors on space. The former are associated with the Hinayana and the latter with the Mahayana forms of Buddhism. Each draws on images of motion and light to articulate its vision of the drama of salvation. W. Randolph Kloetzli has Ph.D. in the History of Religions. He has taught courses in Hinduism, Buddhism and Comparative Religious Cosmologies at The American University, The George Washington University and Dartmouth College. 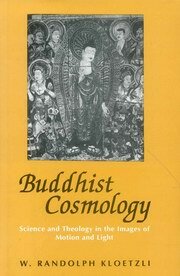 "...a kind of summary of what is found in western literature on the subject of cosmology..." - Elison Snow, The Pacific World, Journal of the Institute of Buddhist Studies, vol. 1, no. 3 Spring 1984.